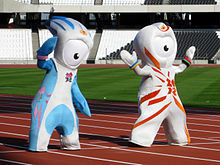 On 8 August LOCOG announced that 2.1 million tickets had been sold (600,000 in the previous month alone), breaking the record of 1.8 million set in Beijing (1.6 million tickets were also distributed by the Chinese government). IPC president Philip Craven congratulated London for this achievement, cring it to "the insatiable appetite the public has for top class elite sport", and noted it would be fitting for a Paralympics held in its spiritual birthplace to have filled venues. By the opening ceremony, 2.4 million had been sold, with the remaining 100,000 sold during the Games; 10,000 were offered each day. The last 800 tickets to the Opening Ceremony were distributed to police and the military, while Mayor Boris Johnson arranged for the distribution of 1,100 to members of London's youth athletics clubs. Due to popular demand, a further 100,000 contingency tickets were released on 6 September (which included multi-event passes, and event tickets given up by sponsors and partners), along with 100,000 giving access solely to the Olympic Park. During the opening ceremony some British athletes reportedly obscured the Atos logo on their accration passes in protest of their involvement. However, an official from the British Paralympic Association denied that this had been the case. LOCOG defended Atos's involvement, stating that the company was "a critical and valued member of [the companies] delivering these Games", due to the technologies it has provided, which included information systems for managing volunteers and distributing event results. Channel 4 was also accused of showing too many studio segments during the first few days of the Games rather than live events, and for missing several notable events involving British athletes, including a swimming heat where Eleanor Simmonds set a new personal best and almost beat the world record, Sarah Storey winning her eleventh Paralympic medal, and Great Britain's opening wheelchair basketball game against Germany. 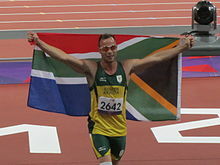 Channel 4 noted that time was needed during the first few days to explain Paralympic events and the classification system to viewers, and that it was operating three additional channels' worth of live coverage throughout the Games. The broadcaster also stated that it had to make orial decisions on which events to air during periods where a large number of events were in progress. The amount of live coverage was also affected by Olympic Broadcasting Services, who did not send cameras or provide official television coverage for sports such as cycling, the marathon, and shooting. Channel 4's news department did send its own cameramen to film the affected events for highlights, but was unable to broadcast them live.